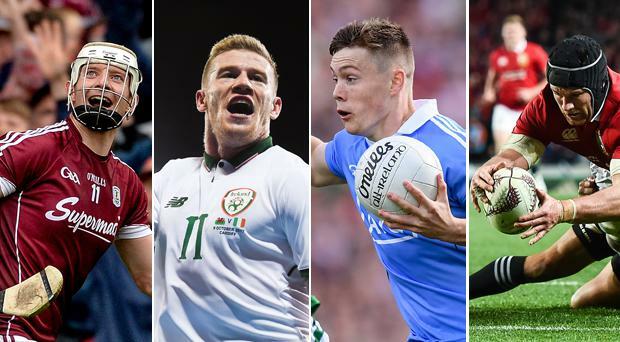 There are have been some moments of individual brilliance in Irish sport thus year. Choose your favourite from 16 of the best sporting plays of 2017 below. A bittersweet moment. The mare came from the clouds to win the Cheltenham Champion Bumper under Jamie Codd. She looked destined to back up her heroics over hurdles this season but tragically died in an accident on Gordon Elliott's gallops. Ireland went into the final game of their World Cup qualifying group against Wales in Cardiff needing a win and James McClean delivered the vital goal after Jeff Hendrick's tenacity had created the opportunity. James McClean with an absolutely crucial strike for the Republic of Ireland vs Wales! Kerry teenager Jack Kennedy produced a moment of sheer genius and nerve aboard Robin Des Mana earlier this month. He was shot out of the saddle at the third fence but somehow managed to keep the partnership together and they went on to win. It was the third successive Galway-Tipperary semi-final to be decided by a point and what a point it was. Under the shadow of the Cusack Stand and acting purely on instinct, the Portumna man split the uprights. How was this man not in the running for the sports personality of the year? Seven trophies across both codes and simply amazing performances throughout 2017. His goal against Tyrone was a joy to behold. The Bray golfer ends 2017 at 76 in the world rankings. The highlight of his season was his first European Tour victory at the British Masters and he sealed the deal in style. The moment Paul Dunne chipped in at the 18th to win the British Masters. The Tullow Tank finished off one of the greatest Lions tries of al time in the first test. Although the Lions lost the game it was a watershed moment for the tourists. The former AFL export enjoyed a fine season with Kildare and earned an All Star nomination. The highlight of his summer was a stunning point in the Leinster final against Dublin. Con O'Callaghan appears for a second time in our selections. His solo goal at the beginning of the All-Ireland final was a beauty. The game may have been done and dusted at the time but Ronan O'Neill cheeky chip in the Ulster final was still one of the highlights of the GAA year. The St Patrick's Athletic midfielder left us gasping for breath in March with an amazing goal from well inside his own half during the Saints 4-0 win over Bohemians at Dalymount Park. It was certainly a night to forget for Mayo as they were pummeled by the Dubs at Croke Park in the National League. Clarke escaped with some credit for an unbelievable triple save. The wing-back was included in Ireland's International Rules squad on the back of his summer performances. His goal in the Rebels narrow qualifier defeat to Mayo was a piece of brilliance. Garry Ringrose scored a try for the ages from inside his own half as Leinster fell agonisingly short of a victory over Clermont in Lyon in their Champions Cup quarter-final. Padraic Maher's hit on Joe Canning in 2016 was a turning point in the 2016 semi-final but he was on the receiving end in August when McInerney levelled him with a shoulder. Olympic silver medallist Paul O’Donovan retained his World lightweight single sculls title in Florida with a truly dominant display. His competitors were only ever racing for silver.